Hawaii's Favorite Fragrant Dendrobium Orchid - Dendrobium anosmum, aka. Dendrobium superbum, or known in Hawaii as Hono-Hono Orchid. The Hono Hono Orchid or Dendrobium anosmum, has been a Hawaiian favorite for many years. The Hono Hono in Hawaiian refers to the plants’ growth habit of alternating leaves, very similar to the introduced weed, Commelina diffusa or Wandering Jew. Oddly it’s the flowers and their exquisite fragrance and not the leaves that keep people exited about growing this orchid. Another interesting fact about this orchid is that its botanical name anosmum actually means without scent! My only guess is that some taxonomist was probably looking at a dried sample, because there is no mistaking the unique fragrance that the Hono Hono has. 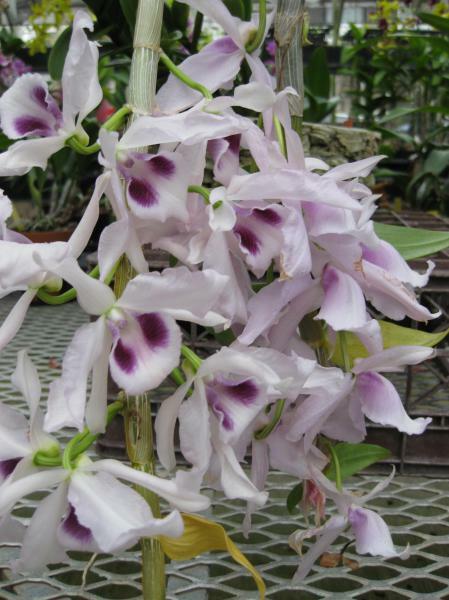 For this article and simplicity sake, I am including the related species and hybrids of Dendrobium anosmum together, since they share similar cultural requirements. To grow the Hono Hono orchid well we must first learn a little about it and where it comes from. Its origin is quite widespread throughout Southeast Asia. This tells us that their dry season is opposite from ours in Hawaii, therefore we need to manipulate our culture to provide the proper environment, enabling us to flower the Hono Hono well. Here is a Hono Hono checklist. This cycle runs from December to February. Dormancy begins when nighttime temperatures drop and watering is reduced. Keeping the orchids dry during our wet season could be difficult. One way is to move them under cover (Polypropylene roof or under the eaves of the house). If the Hono Hono does not go into dormancy, flowering will be poor. Next season’s new growth will emerge before the buds and will compete with bud formation. Hono. It is a good sign when the leaves begin to turn yellow and fall off. into the plump and bare stems (pseudobulbs). the base of the flowering cane. The flowering cycle normally occurs during the months of March to May. Using several different species, hybridizers are making new crosses that bloom at slightly different times. But generally most Hono Hono will flower during this time of year. culled, as there is no cure for viruses. Try to keep water off the flowers. The delicate flowers are susceptible to Botrytis or Flower Blight Fungus. Continue to watch for flower thrips. This is the best time of year that the Hono Hono should be planted or repotted. As new shoots develop so will the new roots. Planting should be done when the new shoots are 4-5 inches long and the emerging roots are one to two inches long. Avoid damaging the tender root tips. The most common media used with pots, is a bark mixture (Approximately 3 parts medium orchid bark, 3 parts peat moss, and 1 part perlite). My favorite is New Zealand Sphagnum Moss. Others like to mount them on Hapuu (Hawaiian Tree Fern), or onto cork. One caution when mounting is that you really need to water often as they tend to dry a lot quicker. slugs as they love to feed on the tender new shoots. During this time the Hono Hono is in its most active growing stage. They are heavy feeders and want abundant water. Grow them in an area of filtered sunlight. Avoid direct midday sunlight, unless you are close to the mountains and have a lot of cloud cover. November fertilizing by mid November. By following some of these basic rules of growing the Hono Hono, you too can be successful. By collecting the different types of Hono Hono, you may be able to stretch their blooming season from February to June. Just imagine having the beautiful flowers and wonderful fragrance for one third of the year! The best thing about growing Hono Hono orchids is that everyone is able to share their extra keikis with friends. This is truly what makes orchid growing fun in Hawaii! *Special thanks to Scot Mitamura who is an Orchid Horticulturalist for the Honolulu Botanical Gardens and has been growing and hybridizing orchids for over 46 years. He can be reached at smitamura@honolulu.gov. *Also special thanks to Mel Waki for letting us use his beatiful Hono-Hono Pictures.